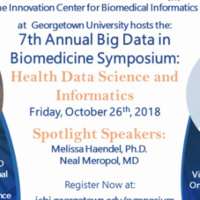 Every year, the Innovation Center for Biomedical Informatics (ICBI) hosts The Annual Big Data in Biomedicine Symposium at Georgetown University. This symposium showcases exciting advances in the areas of molecular medicine, health data analytics, and related state-of-the-art technologies. The free, one-day event includes talks by academic, industry, and government leaders in clinical and translational sciences who will highlight applications of informatics science and tools to advance precision medicine. The symposium brings together a dynamic community of innovators, research scientists, clinicians, program managers, educators, and students to exchange ideas and learn new methodologies. This event also offers an opportunity to network and socialize with colleagues during the evening reception and poster session. The 7th Annual Big Data in Biomedicine Symposim will be held on October 26, 2018 at Georgetown University.